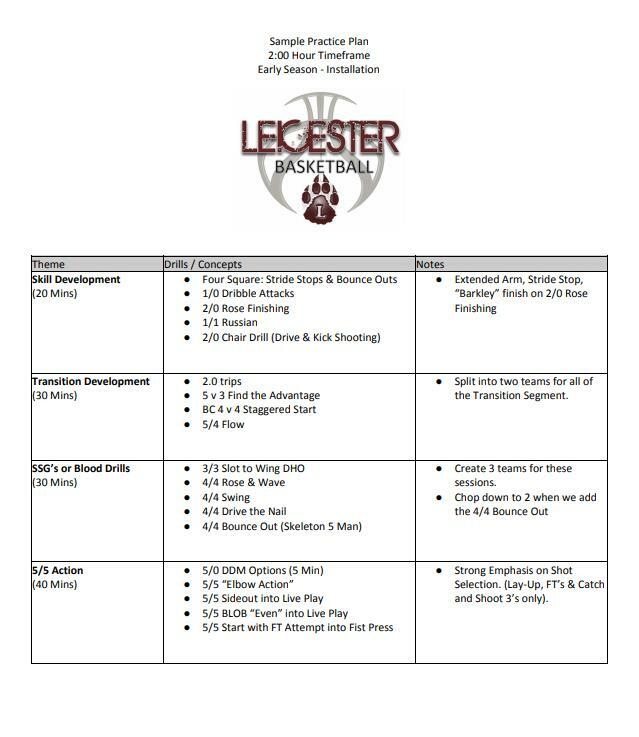 A comprehensive approach to creating a practice plan that simultaneously focuses on skill development and game-like situations. Practice planning is one of the great obsessions of basketball coaches at all levels. There is probably no aspect of their job that coaches spend more time on then designing the perfect practice plan. As a coach, this is perhaps the area where you can have the greatest impact on your team. Practice is where you improve their skills, implement your schemes, and shape the decision-making process for your players. It should go without saying that making sure you are prepared and organized before every practice should be a priority. My personal approach to practice planning is centered around four main themes: Skill Acquisition, Transition Development, Short Sided Games, and 5v5 Live Play. The vast majority of our practices will fall within the timeframe of 1:30 to 2:00 hours. While the specific drills and time dedicated to them may differ between practices the four main themes will be present in them all. We believe that the combination of skill development, short sided games, and realistic five on five play will leave our players well prepared for game day. The more our practices resemble the way our games will be played, the more transfer we will see. In designing our overarching playing style we were inspired by Fergus Connolly’s Game Changer. 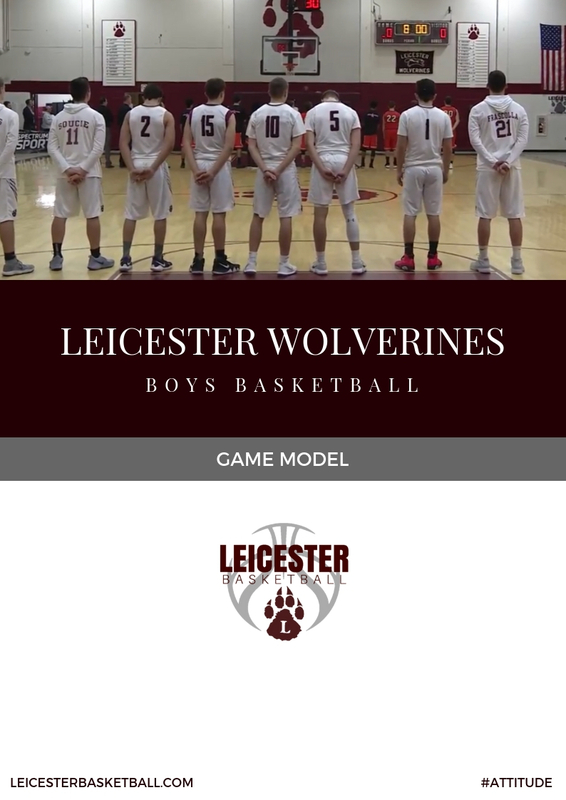 So this summer we created our own Game Model that defines how we want the game to look like in all four phases: Transition Offense, Offense, Transition Defense, and Defense. When it comes to designing our practices we are using the Game Model as our guide. Skill Building Develop players’ skill sets with the ball in their hands, define the decision making process on the catch, establish the spacing-related decisions needed off the basketball. Transition Development Establish Running Lanes, a Read Progression, emphasize finding Early Advantages and teach how to Seamlessly Flow into your Half Court Offense. Short Sided Games Using 2/2, 3/3, & 4/4 Play teach players how to attack space, how to create Double Gaps, react to penetration, and properly second cut. 5v5 Live Play Create game like scenarios in the Half Court, Full Court, and out of Special Situations, using Advantage, Disadvantage, and Neutral Starts. It is crucial to make sure we include a meaningful amount of skill development into our practices. We would like the craft this skill development to fit our Game Model. As a Dribble Drive Motion team, we want to tailor our skill development to fit what our players are going to need to be skilled at. Our focus is on dribble attacks, dribble stops, shooting, finishing at the rim, and 1/1 play in this portion of practice. When addressing skill building we use a progression of drills to teach the technique, spacing, and decision-making involved in each skill. We want to use 1v0 and 2v0 drills initially to introduce the technique and footwork involved in the skill. Then eventually introduce guided defenders, and finally use 1v1 and 2v2 scenarios to teach decision-making within these skills. In season, there is never enough time to approach skills in a singular fashion, so a great way to work on skill development in a reduced time frame is to combine multiple skills into a single drill, aka dynamic drills. A good way to address skill development in each practice but also keep things diverse for your players is to develop an every other day approach. Every practice take a few targeted skills and create 2-3 combination drills that players will use to refine those skills. For example, on Monday we conduct drills that address our “(A)” Day skills, and then on Tuesday we address skill development in the “(B)” Day areas. As part of #PlayerDevelopmentWeek I had a chance to write about the topic of Skill Building for the Dribble Drive Motion Offense more extensively this Summer. 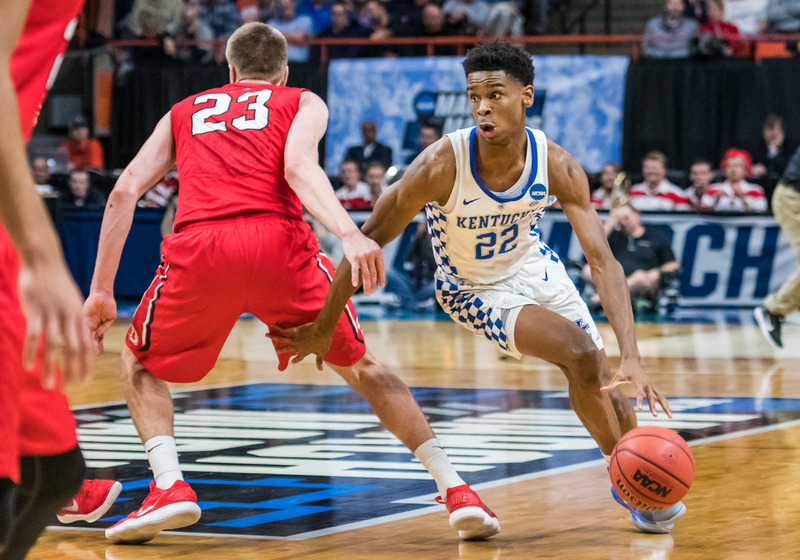 Dribble Drive Motion teams generally have an attack mentality built into their half court play, and we want the to extend to the full court as well. We view the Transition Development portion of our practice as a critical element to our success. In a typical practice, we carve out at least 20-30 minutes to be dedicated to fine tuning our Transition System. The typical progression for this block begins with 5v0 work where players are learning their running lanes and working their way through our transition options. From there, we will progress to 5v2 or 5v3 work where the offense is working on their read progression and finding the advantage as quickly as possible. The rest of this session will be focused on 1) Advancing the basketball with speed, and 2) Seamlessly flowing into Half Court Offense. The goal is to work towards becoming completely seamless from transition to half court offense. We will often use drills that give the offense a slight advantage, which they can use to score or to flow into offense. Using Short Sided Games has become an integral part of our practice plans in recent years. So we typically use various 2v2, 3v3, and 4v4 games to allow our players to get more touches and opportunities to apply the skills we’ve worked on in practice. Naturally, in this section of practice we are trying to create game like scenarios in a smaller setting. There are three key Dribble Drive Motion concepts we want to address here: 1) Second Cutting, 2) Penetration Reactions, and 3) the Creation of Double Gaps. These are all concepts that we want our players to be able to execute in the games without our help, so we must provide the opportunity within our practices to problem solve and read the defense on their own. Coaches familiar with Vance Wahlberg’s “Blood Drills” could use that series in this portion of practice as well. The Blood Drills are a great way to apply dribble attack and finishing skills, while also training your center to appropriately react to penetration. Second Cutting – How to read the defender and know where to cut on a dribble stop. Penetration Reactions – How to maximize spacing and create a scoring opportunity. Creating Double Gaps – How to pass and cut to create double gaps to drive into. Work on Creating Double Gap with 4v4 Neutral Restrictions. Ultimately, the game is played 5-on-5, so we must find an appropriate amount of time to work on live action. In this period we like to see our players put everything together. Set up 5v5 action that allows players to apply what we have worked on in the skill development, transition, and short sided game sections already. We prefer to start each 5v5 session in a realistic deadball scenario, such as a SLOB, BLOB, or a free throw attempt. From there, the goal would be for the players to execute that particular situation and then flow into our Dribble Drive Motion. In these sessions we need to make the environment competitive and place emphasis on the aspect of the game you want to see improvement in. My final thought for this part of practice is for coaches to make spacing their number one priority. Players will thrive in the DDM offense with great floor spacing and the creation of driving gaps on the perimeter. As the players scrimmage, focus your attention on those aspects. The more that you can help your players see proper spacing and ways to create double gaps, the more prepared for games they will be. You can contact Coach Lynch via email at mflynch21@yahoo.com or follow him on Twitter @LeicBasketball. Check out all plays and drills submitted by Coach Michael Lynch on the FMS PlayBank.